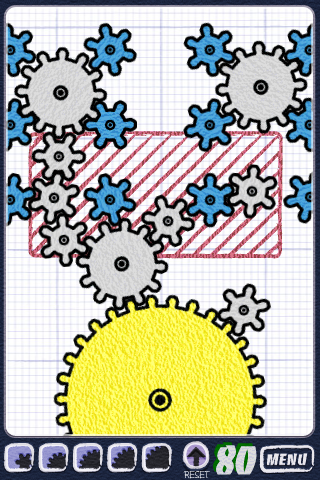 First of all, soon after loading the level, you are able to place cogs almost on top of other existing cogs. If you place several more of your own cogs (in distant places), this ability will disappear. Is this a bug in the game? Maybe. But it does seem to be vital to completing this level. So the first step is to (straight after loading the level) place two small gears almost bang on top of the two central blue gears. They will fall down into the gaps below them. 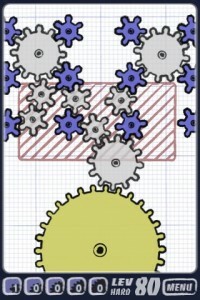 You can then place the big gear above the yellow gear, and drop a smaller one in from above to connect it to the two lower-central blue gears. 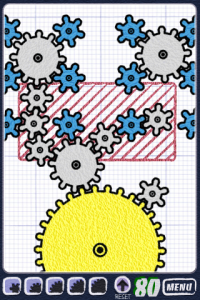 Now the four gears directly above the yellow gear should all be turning. On the left hand side, drop in two small gears to connect the lower-left gear and the one directly up and to the right of it. Try to keep these as low as possible so they don’t interfere with the large gears we will place next. Finally place two large gears in the top-left and top-right. You may have to fiddle with the top-left gear to keep everything turning and not clashing with the small gears we placed. Now you should have the same setup as this image. Just place your final small gear above the bottom-right gear to get everything turning! And even if the gears in the top-left are clashing, the level may complete anyway, which seems like exploiting another bug! I felt a bit cheap completing the game this way, as if I had cheated. But I couldn’t see a more legitimate way to finish the level. Has anyone else managed it? Edit: There has now been an update which addresses the gear placement issue, making this solution no longer possible. Also, there *is* a valid solution. But after googling it I thought I’d tried it already! Perhaps the update made it easier to place the gears correctly? And then just move that small gear on the bottom-right into the gap above it to connect all the gears. This entry was posted in Tech and tagged Geared, iPhone, Level 80. Bookmark the permalink. No way does this work. Not anymore, anyway. You are quite right – it’s been fixed in a patch. But your comment spurred me on to update this post with the correct solution! I can’t get the placement on the big gear at the bottom to where i can drop a small gear on it’s left edge AND drop a small gear to turn the blue gear on it’s right edge. That is probably the hardest bit! You need to align the big gear pixel-perfectly and keep trying to drop the small ones in so they catch it on either side, and the one on the right turns the next gear along. Pingback: 齿轮游戏Geared第80关 | Thank you, Sami!